An infantry fighting vehicle (IFV), also known as a mechanized infantry combat vehicle (MICV), is a type of armoured fighting vehicle used to carry infantry into battle and provide direct-fire support. The 1990 Treaty on Conventional Armed Forces in Europe defines an infantry fighting vehicle as "an armoured combat vehicle which is designed and equipped primarily to transport a combat infantry squad, and which is armed with an integral or organic cannon of at least 20 millimeters calibre and sometimes an antitank missile launcher". IFVs often serve both as the principal weapons system and as the mode of transport for a mechanized infantry unit. Infantry fighting vehicles are distinct from armored personnel carriers (APCs), which are transport vehicles armed only for self-defense and not specifically engineered to fight on their own. IFVs are designed to be more mobile than tanks and are equipped with a rapid-firing autocannon or a large conventional gun; they may include side ports for infantrymen to fire their personal weapons while on board. The IFV rapidly gained popularity with armies worldwide due to a demand for vehicles with high firepower that were less expensive and easier to maintain than tanks. Nevertheless, it did not supersede the APC concept altogether, due to the latter's continued usefulness in specialized roles. Some armies continue to maintain fleets of both IFVs and APCs. West German troops aboard a Schützenpanzer Lang HS.30, the world's first IFV. The infantry fighting vehicle (IFV) concept evolved directly out of that of the armored personnel carrier (APC). During the Cold War, there was an increasing trend towards fitting heavier and heavier weapons systems on an APC chassis to deliver suppressive covering fire as infantry debussed from the vehicle's troop compartment. With the growing mechanization of infantry units worldwide, some armies also came to believe that the embarked personnel should fire their weapons from inside the protection of the APC and only fight on foot as a last resort. [note 1] These two trends led to the IFV, which had firing ports in the troop compartment and a crew-manned weapons system. The IFV created a new niche between combat vehicles which functioned primarily as armored weapons carriers and APCs. During the 1950s, Soviet, US, and most Western European armies had adopted tracked APCs. In 1958, however, the newly-organized Bundeswehr adopted the Schützenpanzer Lang HS.30 (also known simply as the SPz 12-3), which resembled a conventional tracked APC but carried a turret-mounted 20 mm autocannon that enabled it to engage other armored vehicles. The SPz 12-3 is widely considered the first purpose-built IFV. The Bundeswehr's doctrine called for mounted infantry to fight and maneuver alongside tank formations rather than simply being ferried to the edge of the battlefield before dismounting. Each SPz 12-3 could carry five troops in addition to a three man crew. Despite this, it lacked firing ports, forcing the embarked infantry to expose themselves through open hatches to return fire. As the SPz 12-3 was being inducted into service, the French and Austrian armies adopted new APCs which possessed firing ports, allowing embarked infantry to observe and fire their weapons from inside the vehicle. These were known as the AMX-VCI and Saurer 4K, respectively. Austria subsequently introduced an IFV variant of the Saurer 4K which carried a 20 mm autocannon, making it the first vehicle of this class to possess both firing ports and a turreted weapons system. In the mid-1960s, the Swedish Army also adopted a variant of the Pansarbandvagn 302 APC which carried a 20 mm autocannon. 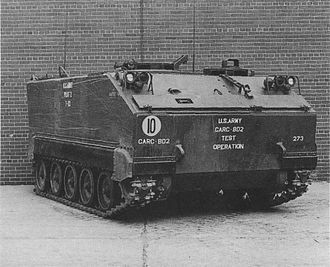 Following the trend towards converting preexisting APCs into IFVs, the Dutch, US, and Belgian armies experimented with a variety of modified M113s during the late 1960s; these were collectively identified as the AIFV. The first US M113-based IFV appeared in 1969; known as the XM765, it had a sharply angled hull, ten vision blocks, a cupola-mounted 20 mm autocannon. The XM765 design was rejected for service but later became the basis for the very similar Dutch YPR-765. 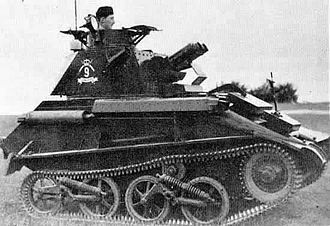 The YPR-765 had five firing ports and a 25 mm autocannon with a co-axial machine gun. The Soviet Army had fielded its first tracked APC, the BTR-50, in 1957. Its first wheeled APC, the BTR-152, had been designed as early as the late 1940s. Early versions of both these lightly armored vehicles were open-topped and carried only general-purpose machine guns for armament. As Soviet strategists became more preoccupied with the possibility of a war involving weapons of mass destruction, they became convinced of the need to deliver mounted troops to a battlefield without exposing them to the radioactive fallout from an atomic weapon. The IFV concept was received favorably because it would enable a Soviet infantry squad to fight from inside their vehicles when operating in contaminated environments. Design work on a new tracked IFV began in the late 1950s and the first prototype appeared as the Obyekt 765 in 1961. After the Soviets had evaluated and rejected a number of other wheeled and tracked prototypes, the Obyekt 765 was accepted for service; it entered serial production as the BMP-1 in 1966. In addition to being amphibious and superior in cross-country mobility to its predecessors, the BMP-1 carried a 73mm smoothbore cannon, a co-axial PKT machine gun, and a launcher for 9M14 Malyutka anti-tank missiles. Its hull was also heavily armored enough to resist .50 caliber armor-piercing ammunition along its frontal arc. Eight firing ports and vision blocks allowed the embarked infantry squad to observe and engage targets with rifles or machine guns. The BMP-1 was so heavily armed and armored that it was widely regarded as having combined the qualities of a light tank with those of the traditional APC. Its use of a relatively large caliber main gun marked a notable departure from the Western trend of fitting IFVs with automatic cannon, which were more suitable for engaging low-flying aircraft, light armor, and dismounted personnel. About 20,000 BMP-1s were produced in the Soviet Union from 1966 to 1983, at which time it was regarded as the most ubiquitous IFV in the world. In Soviet service, the BMP-1 was ultimately superseded by the more sophisticated BMP-2 and the BMP-3. A similar design known as the BMD-1 was designed to accompany Soviet airborne infantry and for a number of years was the world's only airborne IFV. In 1971 the Bundeswehr adopted the Marder, which became increasingly heavily armored through its successive marks and like the BMP was later fitted as standard with a launcher for anti-tank guided missiles. Between 1973 and 1975, the French and Yugoslav armies developed the AMX-10P and BVP M-80, respectively, which were the first amphibious IFVs to appear outside the Soviet Union. The Marder, AMX-10P, and M-80 were all armed with similar 20 mm autocannon and carried seven to eight passengers. They could also be armed with various anti-tank missile configurations. The Ratel, the first wheeled IFV, introduced a number of novel features, such as a mine-protected hull. Wheeled IFVs did not begin appearing until 1976, when the Ratel was introduced in response to a South African Army specification for a wheeled combat vehicle suited to the demands of rapid offensives combining maximum firepower and strategic mobility. Unlike European IFVs, the Ratel was not designed to allow mounted infantrymen to fight in concert with tanks but rather to operate independently across vast distances. South African officials chose a very simple, economical design because it helped reduce the significant logistical commitment necessary to keep heavier combat vehicles operational in undeveloped areas. Excessive track wear was also an issue in the region's abrasive, sandy terrain, making the Ratel's wheeled configuration more attractive. The Ratel was typically armed with a 20 mm autocannon featuring what was then a unique twin-linked ammunition feed, allowing its gunner to rapidly switch between armor-piercing or high-explosive ammunition. Other variants were also fitted with mortars, a bank of anti-tank guided missiles, or a 90 mm cannon. Most notably, the Ratel was the first mine-protected IFV; it had a blastproof hull and was built to withstand the explosive force of anti-tank mines favored by local insurgents. Like the BMP-1, the Ratel proved to be a major watershed in IFV development, albeit for different reasons: until its debut wheeled IFV designs were evaluated unfavorably, since they lacked the weight-carrying capacity and off-road mobility of tracked vehicles, and their wheels were more vulnerable to hostile fire. However, during the 1970s improvements in power trains, suspension technology, and tires had increased their potential strategic mobility. Reduced production, operation, and maintenance costs also helped make wheeled IFVs attractive to several nations. During the late 1960s and early 1970s, the US Army had gradually abandoned its attempts to utilize the M113 as an IFV and refocused on creating a dedicated IFV design able to match the BMP. Although considered reliable, the M113 chassis did not meet the necessary requirements for protection or stealth. The US also considered the M113 too heavy and slow to serve as an IFV capable of keeping pace with tanks. Its MICV-65 program produced a number of unique prototypes, none of which were accepted for service owing to concerns about speed, armor protection, and weight. US Army evaluation staff were sent to Europe to review the AMX-10P and the Marder, both of which were rejected due to high cost, insufficient armor, or lackluster amphibious capabilities. M2 Bradley in US service. In 1973, the FMC Corporation developed and tested the XM723, which was a 21-ton tracked chassis which could accommodate three crew members and eight passengers. It initially carried a single 20 mm autocannon in a one-man turret but in 1976 a two-man turret was introduced; this carried a 25 mm autocannon, a co-axial machine gun, and a TOW anti-tank missile launcher. The XM723 possessed amphibious capability, nine firing ports, and spaced laminate armor on its hull. It was accepted for service with the US Army in 1980 as the Bradley Fighting Vehicle. 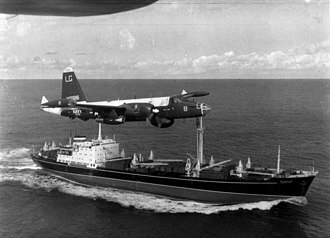 Successive variants have been retrofitted with improved missile systems, gas particulate filter systems, Kevlar spall liners, and increased stowage. The amount of space taken up by the hull and stowage modifications has reduced the number of passengers to six. By 1982 30,000 IFVs had entered service worldwide, and the IFV concept appeared in the doctrines of 30 national armies. The popularity of the IFV was increased by the growing trend on the part of many nations to mechanize armies previously dominated by light infantry. However, contrary to expectation the IFV did not render APCs obsolete. The US, Russian, French, and German armies have all retained large fleets of IFVs and APCs, finding the APC more suitable for multi-purpose or auxiliary roles. The British Army was one of the few Western armies which had neither recognized a niche for IFVs nor adopted a dedicated IFV design by the late 1970s. In 1980, it made the decision to adopt a new tracked armored vehicle, the FV510 Warrior. While normally classified as an IFV, the Warrior fills the role of an APC in British service and infantrymen do not remain embarked during combat. The role of the IFV is closely linked to mechanized infantry doctrine. While some IFVs are armed with an organic direct fire gun or anti-tank guided missiles for close infantry support, they are not intended to assault armored and mechanized forces with any type of infantry on their own, mounted or not. Rather, the IFV's role is to give an infantry unit tactical and strategic mobility during combined arms operations. Most IFVs either complement tanks as part of an armored battalion, brigade, or division; others perform traditional infantry missions supported by tanks. Early development of IFVs in a number of Western nations was promoted primarily by armor officers who wanted to integrate tanks with supporting infantry in armored divisions. 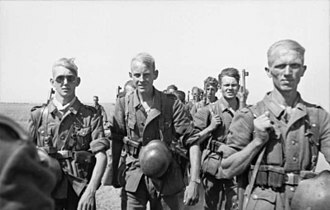 There were a few exceptions to the rule: for example, the Bundeswehr's decision to adopt the SPz 12-3 was largely due to the experiences of Wehrmacht panzergrenadiers who had been inappropriately ordered to undertake combat operations better suited for armor. Hence, the Bundeswehr concluded that infantry should only fight while mounted in their own armored vehicles, ideally supported by tanks. This doctrinal trend was later subsumed into the armies of other Western nations, including the US, leading to the widespread conclusion that IFVs should be confined largely to assisting the forward momentum of tanks. The Soviet Army granted more flexibility in this regard to its IFV doctrine, allowing for the mechanized infantry to occupy terrain that compromised an enemy defense, carry out flanking movements, or lure armor into ill-advised counterattacks. 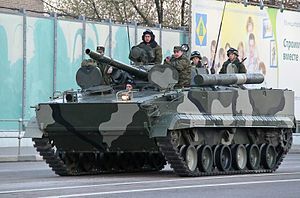 While they still performed an auxiliary role to tanks, the notion of using IFVs in these types of engagements dictated that they be heavily armed, which was reflected in the BMP-1 and its successors. Additionally, Soviet airborne doctrine made use of the BMD series of IFVs to operate in concert with paratroops rather than traditional mechanized or armored formations. IFVs assumed a new significance after the Yom Kippur War. In addition to heralding the combat debut of the BMP-1, that conflict demonstrated the newfound significance of anti-tank guided missiles and the obsolescence of independent armored attacks. More emphasis was placed on combined arms offensives, and the importance of mechanized infantry to support tanks reemerged. As a result of the Yom Kippur War, the Soviet Union attached more infantry to its armored formations and the US accelerated its long-delayed IFV development program. An IFV capable of accompanying tanks for the purpose of suppressing anti-tank weapons and the hostile infantry which operated them was seen as necessary to avoid the devastation wreaked on purely armored Israeli formations. The US Army defines all vehicles classed as IFVs as having three essential characteristics: they are armed with at least a medium-caliber cannon or automatic grenade launcher, at least sufficiently protected against small arms fire, and possess off-road mobility. It also identifies all IFVs as having some characteristics of an APC and a light tank. The United Nations Register for Conventional Arms (UNROCA) simply defines an IFV as any armored vehicle "designed to fight with soldiers on board" and "to accompany tanks". UNROCA makes a clear distinction between IFVs and APCs, as the former's primary mission is combat rather than general transport. All IFVs possess armored hulls protected against rifle and machine gun fire. Most have lighter armor than main battle tanks to ensure mobility. Armies have generally accepted risk in reduced protection to recapitalize on an IFV's mobility, weight and speed. Their fully enclosed hulls offer protection from artillery fragments and residual environmental contaminants as well as limit exposure time to the mounted infantry during extended movements over open ground. Many IFVs also have sharply angled hulls that offer a relatively high degree of protection for their armor thickness. The BMP, Boragh, BVP M-80, and their respective variants all possess steel hulls with a distribution of armor and steep angling that protect them during frontal advances. The BMP-1 was vulnerable to heavy machine gun at close range on its flanks or rear, leading to a variety of more heavily armored marks appearing from 1979 onward. The Bradley possessed a lightweight aluminum alloy hull, which in most successive marks has been bolstered by the addition of explosive reactive and slat armor, spaced laminate belts, and steel track skirts. Throughout its life cycle, an IFV is expected to gain 30% more weight from armor additions. As asymmetric conflicts become more common, an increasing concern with regards to IFV protection has been adequate countermeasures against land mines and improvised explosive devices. During the Iraq War, inadequate mine protection in US Bradleys forced their crews to resort to makeshift strategies such as lining the hull floors with sandbags. A few IFVs, such as the Ratel, have been specifically engineered to resist mine explosions. IFVs may be armed with autocannons of various calibers, commonly 20mm to 57mm, 73mm to 100mm low or medium velocity tank guns, anti-tank guided missiles, or automatic grenade launchers. With a few exceptions, such as the BMP-1 and the BMP-3, designs such as the Marder and the BMP-2 have set the trend of arming IFVs with an autocannon suitable for use against lightly armored vehicles, low-flying aircraft, and dismounted infantry. This reflected the growing inclination to view IFVs as auxiliaries of armored formations: a small or medium caliber autocannon was perceived as an ideal suppressive weapon to complement large caliber tank fire. IFVs armed with miniature tank guns did not prove popular because many of the roles they were expected to perform were better performed by accompanying tanks. The BMP-1, which was the first IFV to carry a relatively large gun, came under criticism during the Yom Kippur War for its mediocre individual accuracy, due in part to the low velocities of its projectiles. During the Soviet–Afghan War, BMP-1 crews also complained that their armament lacked the elevation necessary to engage insurgents in mountainous terrain. The effectiveness of large caliber, low-velocity guns like the 2A28 Grom on the BMP-1 and BMD-1 was also much reduced by the appearance of Chobham armor on Western tanks. The Ratel, which included a variant armed with a 90mm low-velocity gun, was utilized in South African combat operations against Angolan and Cuban armored formations during the South African Border War, with mixed results. Although the Ratels succeeded in destroying a large number of Angolan tanks and APCs, they were hampered by many of the same problems as the BMP-1: mediocre standoff ranges, inferior fire control, and a lack of stabilized main gun. The Ratels' heavy armament also tempted South African commanders to utilize them as light tanks rather than in their intended role of infantry support. A Marder fires a MILAN anti-tank missile. Another design feature of the BMP-1 did prove more successful in establishing a precedent for future IFVs: its inclusion of an anti-tank missile system. This consisted of a rail-launcher firing 9M14 Malyutka missiles which had to be reloaded manually from outside the BMP's turret. Crew members had to expose themselves to enemy fire to reload the missiles, and they could not guide them effectively from inside the confines of the turret space. The BMP-2 and later variants of the BMP-1 made use of semiautonomous guided missile systems. 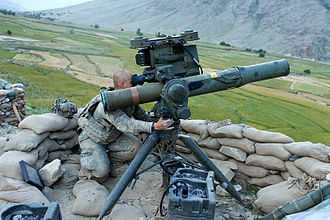 In 1978, the Bundeswehr became the first Western army to embrace this trend when it retrofitted all its Marders with launchers for MILAN anti-tank missiles. The US Army added a launcher for TOW anti-tank missiles to its fleet of Bradleys, despite the fact that this greatly reduced the interior space available for seating the embarked infantry. This was justified on the basis that the Bradley needed to not only engage and destroy other IFVs, but support tanks in the destruction of other tanks during combined arms operations. IFVs are designed to have the strategic and tactical mobility necessary to keep pace with tanks during rapid maneuvers. Some, like the BMD series, have airborne and amphibious capabilities. IFVs may be either wheeled or tracked; tracked IFVs are usually more heavily armored and possess greater carrying capacity. 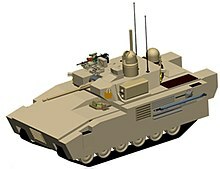 Wheeled IFVs are cheaper and simpler to produce, maintain, and operate. From a logistical perspective, they are also ideal for an army without widespread access to transporters or a developed rail network to deploy its armor. ^ During the Six-Day War, for example, Syrian motorized infantry used their BTR-152 and BTR-40 APCs as firing platforms and rarely debarked to fight on foot. ^ a b c d e f g h i j Foss, Christopher (1991). "Versatile roles of the APC and MICV". Jane's Defence Weekly. 4: 271. ^ Martin J. Dougherty, Chris McNab (2010). Combat Techniques: An Elite Forces Guide to Modern Infantry Tactics. Macmillan. ISBN 978-0-312-36824-1. Retrieved 5 March 2011. ^ a b Viotti, Paul (2010). Arms Control and Global Security: A Document Guide, Volume 2. Santa Barbara, California: ABC-CLIO, Publishers. p. 169. ISBN 978-0-313-35430-4. ^ a b "International Issues Review (June 1984)" (PDF). Langley: Central Intelligence Agency. June 1984. p. 7. Archived from the original (PDF) on 23 January 2017. Retrieved 20 June 2017. ^ Campbell, David (2016). Israeli Soldier vs Syrian Soldier: Golan Heights 1967–73. Oxford: Osprey Publishing. pp. 1–61. ISBN 978-1-4728-1330-5. ^ a b c d e f g h i j k l m n o p q r s t u v w x y z aa ab ac ad ae af ag ah ai aj ak al am an ao ap aq ar as at au av Besch, Edwin (July 1983). "Infantry fighting Vehicles: Their Evolution and Significance". Marine Corps Gazette. Marine Corps Base Quantico: Marine Corps Association: 50–60. ^ a b c d e f g h i j k l m n o p q r s t u v w x y z aa ab ac ad Guardia, Mike (2016). Bradley versus BMP: Desert Storm 1991. Oxford: Osprey Publishing. pp. 8–29, 30–32. ISBN 978-1-4728-1520-0. ^ a b c d e f g h i j k l m n o p q r Coffey, Rod (2000). "Doctrinal Orphan or Active Partner? A History of US Mechanized Infantry Doctrine". Fort Leavenworth: United States Army Command and General Staff College. Retrieved 17 February 2018. ^ a b c Rodgers, Russell (2014). Dowling, Timothy, ed. Russia at War: From the Mongol Conquest to Afghanistan, Chechnya, and Beyond. Santa Barbara: ABC-CLIO, Publishers. pp. 135–137. ISBN 978-1-59884-947-9. ^ a b c d Camp, Steve; Helmoed-Römer, Heitman (November 2014). Surviving the Ride: A pictorial history of South African Manufactured Mine-Protected vehicles. Pinetown: 30 Degrees South. pp. 166–179. ISBN 978-1-928211-17-4. ^ a b c d e f Harmse, Kyle; Dunstan, Simon (23 February 2017). South African Armour of the Border War 1975–89. Oxford: Osprey Publishing. pp. 21–31. ISBN 978-1-4728-1743-3. ^ a b c d e f g Parker, Sarah (2016). Clapham, Andrew; Casey-Maslen, Stuart; Giacca, Gilles, eds. The Arms Trade Treaty: A Commentary. Oxford: Oxford University Press. p. 77. ISBN 978-0198723523. ^ Royal United Services Institute for Defence and Security Studies. Method Publishing. 2004. p. 30. Retrieved 31 March 2011. ^ a b Scholtz, Leopold (2012). 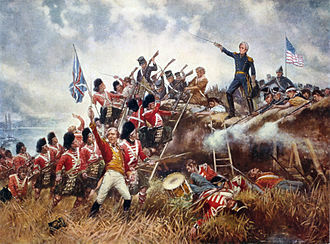 "The Lessons of the Border War". Stellenbosch: Military Science Department, Stellenbosch University. Archived from the original on 28 January 2015. Retrieved 24 March 2017. ^ "Ratel teen tenk en". Port Elizabeth: International Veterans' Association/South African Forces Club. 2011. Archived from the original on 25 April 2011. Retrieved 20 September 2016. The BTR-50 is a Soviet amphibious armored personnel carrier based on the PT-76 light tank. The BTR-50 is tracked, unlike most in the BTR series, the BTR-50 shares many similarities with two other APCs, the OT-62 TOPAS and the Type 77. Like the PT-76, the BTR-50 has a flat, boat-shaped hull, unlike the PT-76, it has a new superstructure added to the front of the vehicle. The hull of the BTR-50 is made of all-welded steel with the compartment in the front, the troop compartment in the center. It has the ability to transport up to 20 fully equipped infantrymen and they mount and dismount the APC by climbing over the sides of the hull. The driver sits in the center of the front of the hull and has three blocks and periscopes located at the top of the sloping glacis plate. During night operations, the periscope can be swapped for the TVN-28 night vision device. The driver has a hatch that opens upwards—while it cannot be used to leave the vehicle. In combat, the hatch is closed and the driver can use a vision block, there is an emergency hatch under the drivers seat. The AIFV is a tracked light armored vehicle that serves as an infantry fighting vehicle in the armies of several countries. It is a development of the M113A1 armored personnel carrier, the XM765 was based on the M113A1, upgraded with an enclosed turret and firing ports, so that the infantry could fight from within the vehicle. 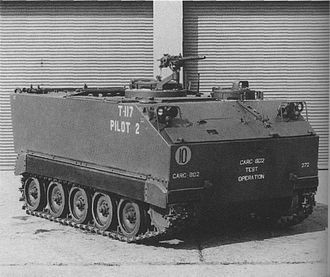 The army evaluated the vehicle, but decided that they wanted a better protected and more mobile vehicle, FMC continued development as a private venture, resulting in the product improved M113A1 in 1970. The PI M113A1 had the driver and engine at the front, with an enclosed weapon station in the center of the hull and this arrangement meant that the commander had a very poor forward view. FMC went back to the board and came up with a new design, which had the driver on the front left of the hull. To the right of the commander was a one-man turret, the vehicle would be designated the AIFV. While the US was uninterested in the design, a number of other governments were interested in the vehicle, which was simpler and cheaper than the Bradley. 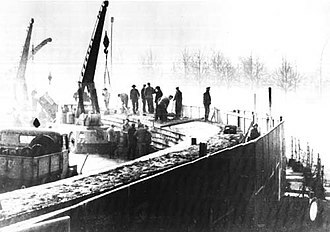 Some changes were made at the request of the Dutch government, including shifting the station to the right side. The Netherlands ordered 2,079, of which 815 were produced locally under license, under the YPR-2000 program, virtually all Dutch vehicles were upgraded to YPR-765A1 standard and are easily identified by the 3-tone NATO camouflage pattern. During the war in Afghanistan, several vehicles were fitted with additional armour, the Philippines received 45 vehicles in 1979, these were intended to take 25mm cannons, although some were modified to fit 12. 7mm machine guns. In 1979, Belgium placed an order for 514 AIFV-B along with 525 M113A-B, the first vehicles were delivered in 1982. Turkey selected the AIFV in 1989, after a competition involving the Alvis Vickers Warrior IFV, the total value of the contract for 1,698 vehicles was US$1.076 billion. The first 285 hulls were produced in Belgium, the vehicles were produced entirely in Turkey. During the production run, a number of changes were made to the armament of the vehicle, including different turret packages, the hull of the vehicle is made of welded aluminum, with spaced steel laminate armor bolted onto the side and front. A land mine is an explosive device concealed under or on the ground and designed to destroy or disable enemy targets, ranging from combatants to vehicles and tanks, as they pass over or near it. Such a device is typically detonated automatically by way of pressure when a target steps on it or drives over it, a land mine may cause damage by direct blast effect, by fragments that are thrown by the blast, or by both. The name originates from the ancient practice of mining, where tunnels were dug under enemy fortifications or troop formations. These killing tunnels were at first collapsed to destroy targets located above, nowadays, in common parlance, land mine generally refers to devices specifically manufactured as anti-personnel or anti-vehicle weapons. The use of mines is controversial because of their potential as indiscriminate weapons. They can remain dangerous many years after a conflict has ended, harming the economy, to date,162 nations have signed the treaty. To act as passive area-denial weapons, land mines are currently used in large quantities mostly for this first purpose, thus their widespread use in the demilitarized zones of likely flashpoints such as Cyprus and Korea. As of 2013, the governments that still laid land mines were Myanmar in its internal conflict. Land mines continue to kill or injure at least 4,300 people every year, even decades after the ends of the conflicts for which they were placed. This claim is dubious, as gunpowder warfare did not develop in China until the advent of the flamethrower in the 10th century, while the land mine was not seen in China until the late 13th century. Explosive land mines were being used in 1277 by the Chinese during the Song dynasty against an assault of the Mongols, the invention of this detonated enormous bomb was credited to one Lou Qianxia of the 13th century. The wad of the mine was made of wood, carrying three different fuses in case of defective connection to the touch hole. Pieces of bamboo are sawn into sections nine feet in length, all septa in the bamboo being removed, save only the last, boiling oil is next poured into and left there for some time before being removed. The fuse starts from the bottom, and is compressed into it to form an explosive mine, the gunpowder fills up eight-tenths of the tube, while lead or iron pellets take up the rest of the space, the open end is sealed with wax. A trench five feet in depth is dug, the fuse is connected to a firing device which ignites them when disturbed. 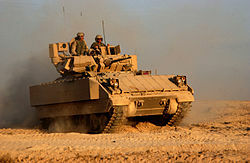 The Bradley Fighting Vehicle is an American fighting vehicle platform manufactured by BAE Systems Land and Armaments, formerly United Defense. The Bradley is designed to transport infantry or scouts with armor protection, while providing covering fire to enemy troops. There are several Bradley variants, including the M2 Bradley infantry fighting vehicle, the M2 holds a crew of three along with six fully equipped soldiers. The M3 mainly conducts scout missions and carries two scouts in addition to the crew of three, with space for additional TOW missiles. The Red River Army Depot in Texarkana, Texas is the Center of Industrial Technical Excellence for the maintenance, the Bradley was developed largely in response to the Soviet BMP family of infantry fighting vehicles, and to serve as both an armored personnel carrier, and a tank-killer. One specific design requirement was that it should be as fast as the new M1 Abrams main battle tank so that they could maintain formations while moving. The M2/M3s primary armament is a 25 mm cannon that fires up to 200 rounds per minute and is accurate up to 3000 m and it is armed with a TOW missile launcher that is capable of carrying two loaded missiles. The missiles, capable of destroying most tanks to a range of 4,000 metres. The Bradley carries a coaxial 7.62 mm medium machine gun, the Bradley is equipped with the M24225 mm chain gun as its main weapon. The M242 has a barrel with an integrated dual-feed mechanism. The gun has 300 rounds of ammunition in two boxes, with an extra 600 rounds in storage or 1200 stowed rounds. The two ready boxes allow a mix of rounds, such as the M791 APDS-T and M792 HEI-T rounds. The tungsten APDS-T rounds proved highly effective in Desert Storm, being capable of knocking out many Iraqi vehicles including several kills on T-55 tanks, there have even been reports of kills against Iraqi T-72 tanks at close range. 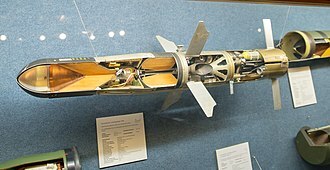 Subsequent ammunition developments resulted in the M919 APFSDS-T round, which contains a finned depleted uranium penetrator similar in concept to armor-piercing munitions used in modern tanks, the M919 was used in combat during the 2003 invasion phase of Operation Iraqi Freedom. 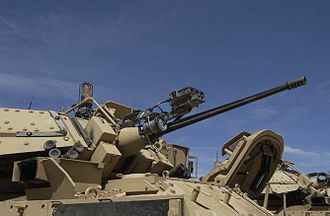 It is armed with an M240C machine gun mounted coaxially to the M242, for engaging heavier targets, the Bradley has a TOW missile system on board, which was changed to fire TOW II missile from the M2A1 model onwards. An armoured personnel carrier is a type of armoured fighting vehicle designed to transport infantry to the battlefield. APCs are colloquially referred to as taxis or battle buses. Armoured personnel carriers are distinguished from infantry fighting vehicles by the weaponry they carry, by convention, they are not intended to take part in direct-fire battle, but are armed for self-defence and armoured to provide protection from shrapnel and small arms fire. Examples include the American M113, the French VAB, the Dutch-German GTK Boxer, the genesis of the armoured personnel carrier was on the Western Front of World War I. In the stage of the war, Allied tanks could break through enemy lines, without infantry support, the tanks were isolated and more easily destroyed. In response, the British experimented with carrying machine-gun crews in the Mark V* tank, britain therefore designed the first purpose built armoured troop transport, the Mark IX, but the war ended before it could be put to use. During World War II, half-tracks like the American M3 and German SdKfz 251 played a similar to post-war APCs. 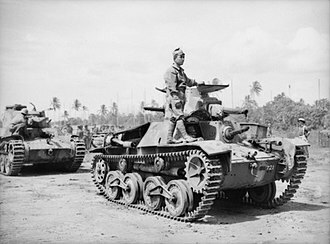 British Commonwealth forces relied on the full-tracked Universal Carrier, over the course of the war, APCs evolved from simple armoured cars with transport capacity, to purpose built vehicles. Obsolete armoured vehicles were repurposed as APCs, such as the various Kangaroos converted from M7 Priest self-propelled guns and from Churchill, M3 Stuart, during the Cold War, more specialized APCs were developed. Western nations have since retired most M113s, replacing them with newer APCs, the Soviet Union produced the BTR-40, BTR-152, BTR-60, BTR-70, BTR-80 in large numbers. The BTR-60 and BTR-80 remain in production and Poland together developed the universal amphibious OT-64 SKOT. A cold war example of a Kangaroo is the heavily armoured Israeli Achzarit, weight can vary from 6 to 40 tons or more, but 9 to 20 tons is typical. 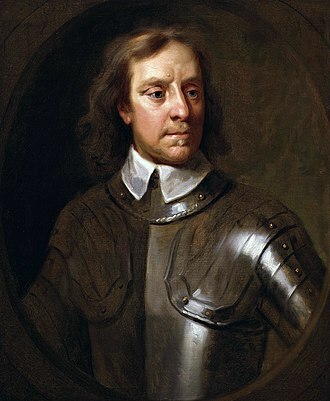 Most have a capacity of between 8 and 12 dismountable troops, although some can carry more than 20, in addition, it has a crew of at least one driver, many with a gunner and/or commander as well. An armoured fighting vehicle is a combat vehicle, protected by strong armour and generally armed with weapons, which combines operational mobility, tactical offensive, and defensive capabilities. AFVs can be wheeled or tracked and it is not uncommon for AFVs to be simply referred to as armour. Armoured fighting vehicles are classified according to their role on the battlefield. This classification is not absolute, at different times different countries will classify the vehicle in different roles. For example, armoured carriers were generally replaced by infantry fighting vehicles in a similar role. Modern armoured fighting vehicles are the realization of an ancient concept, War machines with rudimentary armour have been used in battle for millennia. These designs historically struggled between the paradox of exposed-mobility, effective-firepower and cumbersome-protection, Siege engines, such as battering rams and trebuchets, would often be armoured in order to protect the crews from the defenders. 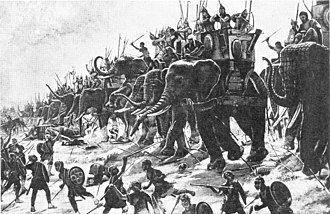 Very large movable siege towers, helepolis were developed by Polyidus of Thessaly, the idea of a vehicle with a tortoise like cover has been known since antiquity. Frequently cited is Leonardo da Vincis 15th century sketch of a mobile, protected gun platform, the machine was to be mounted on four wheels which would be turned by the crew through a system of hand cranks and cage gears. Leonardo quoted I will build armored wagons which will be safe, there will be no obstacle which it cannot overcome. Modern replicas have demonstrated that the crew would have been able to move it over only short distances. The war wagon were medieval weapon-platforms developmed during the Hussite Wars around 1420 by Hussite forces rebelling in Bohemia. These heavy wagon were given protective sides with firing slits and heavy firepower from either a cannon or a force of hand-gunners and crossbowmen, supported by infantry using pikes, heavy arquebuses mounted on wagons were called arquebus à croc. These carried a ball of about 3.5 ounces, the first modern AFVs were armed cars, dating back virtually to the invention of the motor car. A main battle tank, known as a battle tank or universal tank, is a tank that fills the armor-protected direct fire and maneuver role of many modern armies. Through the 1960s, the MBT replaced almost all other tanks, main battle tanks are considered a key component of modern armies. Modern MBTs seldom operate alone, as they are organized into armoured units which involve the support of infantry and they are often supported by surveillance or ground-attack aircraft. 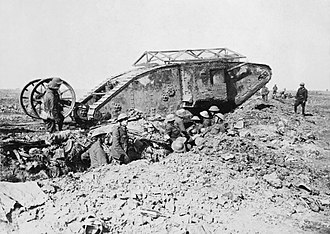 In World War I, tanks were classed into light and heavy based on weight, as tank combat evolved, tank design suffered from a number of limitations due largely to engine power and transmission capability. 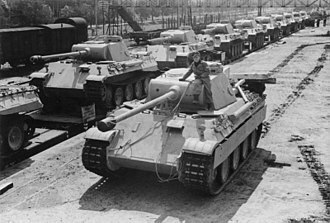 A designer could produce a tank with high maneuverability, armour, or a large gun, the first prioritised maneuverability, and thus had a limit on weight. These were known variously as cavalry tanks, light tanks, medium tanks and these tanks had different uses depending on the countrys tank doctrine, but were generally used to exploit holes in the enemy lines and run far into the rear areas in self-supporting armoured groups. This would disrupt enemy logistics and command-and-control, as well as delay the movement of reserves to the front and it was believed operations of this sort would undermine or completely destroy the ability for the front-line troops to continue battle. The second class prioritised armour and thus weighed more, limiting maneuverability and these were known as infantry tanks, heavy tanks, or assault tanks. They were generally designed to assault enemy lines, working in concert with front-line infantry, as these were expected to move forward at the same speed as the men, higher speeds were not required and the engine power could instead be used to carry a much greater load. Infantry tanks featured much larger amounts of armour, heavier guns, as the nature of tank warfare evolved, tanks designed for other specialised roles saw development. This included dedicated tank destroyers, and engineer tanks such as Hobarts Funnies, Tank destroyers had varied successes, and often ended up engaging enemy infantry instead of their intended targets. German assault gun armoured vehicles like the Sturmgeschütz III were found effective in an anti-tank role, in spite of a great amount of theory and pre-war testing, the plans for armoured combat quickly proved themselves outdated. The battlefield did not bog down like it did in World War I and this was especially evident in the great sweeping battles in North Africa and the Soviet Union, where armoured forces executed drives of hundreds of miles. In these cases the problems with having two became especially evident, the tanks able to go toe-to-toe with the enemy were generally found miles to the rear. Those able to maintain the drive were lightly armoured, and proved easy prey for enemy anti-tank guns, as these evolved, the tanks own weapons had to grow larger in order to deal with enemy tanks with the same level of armour. This evolution led to the development of a more general-purpose medium tank, medium tanks formed the bulk of the tank combat forces. Generally these designs massed about 25-30 tonnes, were armed with cannons around 75 mm, notable examples include the Soviet T-34, the German Panzer IV, and the US M4 Sherman. The United Nations is an intergovernmental organization to promote international co-operation. A replacement for the ineffective League of Nations, the organization was established on 24 October 1945 after World War II in order to prevent another such conflict, at its founding, the UN had 51 member states, there are now 193. The headquarters of the UN is in Manhattan, New York City, further main offices are situated in Geneva and Vienna. The organization is financed by assessed and voluntary contributions from its member states, the UNs mission to preserve world peace was complicated in its early decades by the Cold War between the US and Soviet Union and their respective allies. The organization participated in actions in Korea and the Congo. After the end of the Cold War, the UN took on major military, the UN has six principal organs, the General Assembly, the Security Council, the Economic and Social Council, the Secretariat, the International Court of Justice, and the UN Trusteeship Council. UN System agencies include the World Bank Group, the World Health Organization, the World Food Programme, UNESCO, the UNs most prominent officer is the Secretary-General, an office held by Portuguese António Guterres since 2017. Non-governmental organizations may be granted consultative status with ECOSOC and other agencies to participate in the UNs work, the organization won the Nobel Peace Prize in 2001, and a number of its officers and agencies have been awarded the prize. Other evaluations of the UNs effectiveness have been mixed, some commentators believe the organization to be an important force for peace and human development, while others have called the organization ineffective, corrupt, or biased. 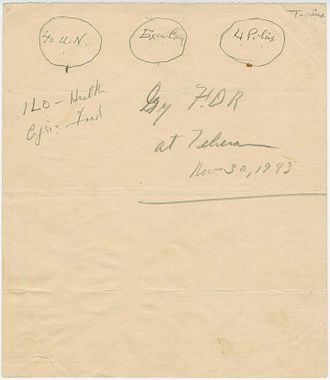 Following the catastrophic loss of life in the First World War, the earliest concrete plan for a new world organization began under the aegis of the US State Department in 1939. It incorporated Soviet suggestions, but left no role for France, four Policemen was coined to refer to four major Allied countries, United States, United Kingdom, Soviet Union, and China, which emerged in the Declaration by United Nations. Roosevelt first coined the term United Nations to describe the Allied countries, the term United Nations was first officially used when 26 governments signed this Declaration. One major change from the Atlantic Charter was the addition of a provision for religious freedom, by 1 March 1945,21 additional states had signed. Each Government pledges itself to cooperate with the Governments signatory hereto, the foregoing declaration may be adhered to by other nations which are, or which may be, rendering material assistance and contributions in the struggle for victory over Hitlerism. During the war, the United Nations became the term for the Allies. To join, countries had to sign the Declaration and declare war on the Axis, at the meetings, Lord Halifax deputized for Mr. Eden, Wellington Koo for T. V. Soong, and Mr Gromyko for Mr. Molotov. 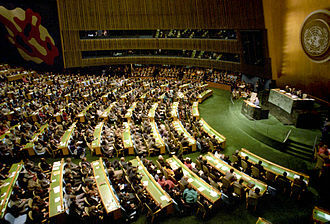 The first meetings of the General Assembly, with 51 nations represented, the General Assembly selected New York City as the site for the headquarters of the UN, and the facility was completed in 1952. The South African Army is the army of South Africa, first formed after the Union of South Africa was created in 1910. The South African military evolved within the tradition of frontier warfare fought by Boer Commando forces, the role of the Army was fundamentally changed by the upheavals of the early 1990s and after 1994 the Army became part of the new South African National Defence Force. It is now becoming involved in peacekeeping efforts in southern Africa. The Army is composed of roughly 40,100 regular uniformed personnel, the rank/age structure of the army, which deteriorated desperately during the 1990s, is greatly improving through the Military Skills Development voluntary national service system. Through this system, young members are being inducted into the regular. The 1912 law obligated all males between seventeen and sixty years of age to serve in the military, but this was not strictly enforced as there were a large number of volunteers. Instead, half of the males aged from 17 to 25 were drafted by lots into the ACF. 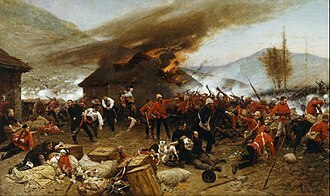 For training purposes, the Union was divided into 15 military districts, the Permanent Force consisted of five regiments of the South African Mounted Riflemen, each with a battery of artillery attached. Dorning says that. 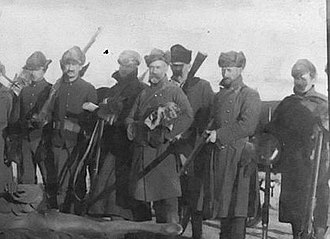 the SAMR was in reality a military constabulary similar to the Cape Mounted Riflemen, in 1913 and 1914, the new 23, 400-member Citizen Force was called on to suppress several industrial strikes on the Witwatersrand. In accordance with the 1912 Defence Act, the Active Citizen Force was established under Brig. Gen. C. F, the authorised strength of the ACF and Coast Garrison Force was 25,155 and by 31 December actual strength stood at 23,462. 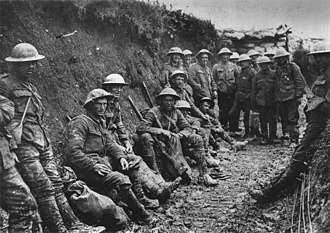 When World War I broke out in 1914, the South African government chose to join the war on the side of the Allies, the German troops stationed there eventually surrendered to the South African forces in July 1915. 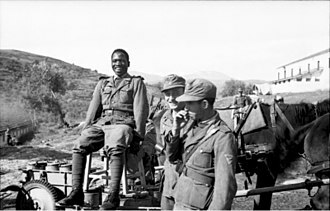 Later, a brigade and various other supporting units were shipped to France in order to fight on the Western Front as the South African Overseas Expeditionary Force. 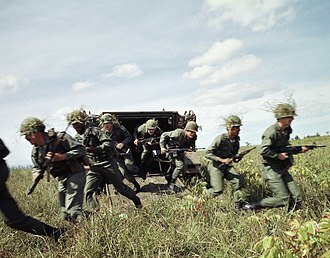 U.S. Army mechanized infantry dismount from an M113 armored personnel carrier during training in 1985. 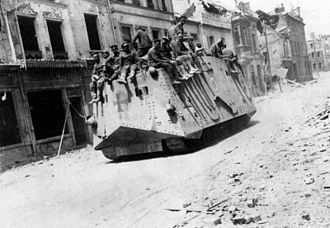 21 March 1918: German A7V tanks in Roye, Somme during Operation Michael. Stryker vehicle and dismounted infantry of the US Army's 1st Brigade Combat Team in Mosul, Iraq 2004. The British Mark IX tank was the first specialised armoured personnel carrier. A Großer Zapfenstreich at Ramstein Air Base in 2002. The Federal Republic of Germany joined NATO in 1955. 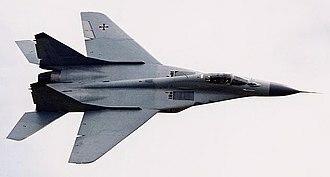 The Bundeswehr was the first NATO member to use the Soviet-built MiG 29 jet, taken over from the former East German Air Force after reunification. Israeli-modified ex-Syrian or ex-Egyptian late-production model BTR-50PK APC at the Yad La-Shiryon Museum, Israel. 2005. Front of the Israeli-modified ex-Syrian or ex-Egyptian late-production model BTR-50PK APC at the Yad la-Shiryon Museum, Israel. 2005. Note the elevated trim vane and IR searchlight. Rear view of the same APC. The two water-jets have their lids closed. A US Army recognition poster. Polish BMP-1 (BWP-1) during a training exercise. Two Bulgarian Army soldiers man the driver's and gunner's stations, while a US Army soldier occupies the commander's position of a Bulgarian BMP-1 IFV. Original PK. Note the partially-fluted barrel and long-slotted flash hider. A 9S415 control box for the Malyutka missile. 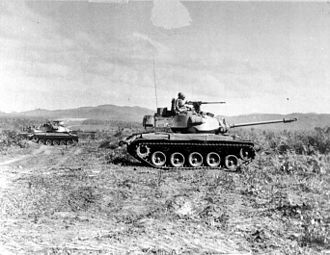 South Vietnamese M41 Walker Bulldog tanks during a training operation. Russian BMP-2 during a rehearsal for the military parade in Yekaterinburg, 6 May 2009. BMP-1, the predecessor of the BMP-2, at US Bolling Air Force Base, 1 October 1986. Indian Army's upgraded BMP-2 Sarath during military exercise in Rajasthan, India. BMP-2D on display near the Great Patriotic War Museum, Kiev, 4 September 2005. A Marder A3 of Panzergrenadier Battalion 391 in 2006. A Marder 1 A3 fires its 20 mm cannon in an exercise. 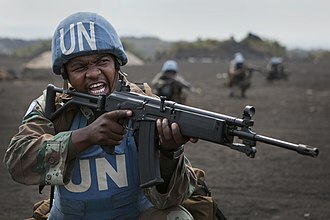 South African soldier serving as part of the United Nations Force Intervention Brigade in the Democratic Republic of the Congo. An M41 tripod-mounted TOW ITAS-FTL with PADS of the U.S. Army in Kunar Province, Afghanistan in May 2009. 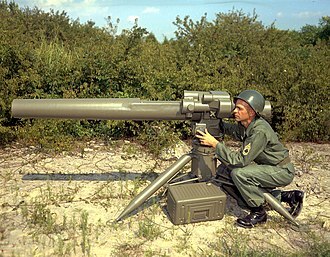 A U.S. Army soldier in 1964, with the first concept mock-up of Redstone Arsenal's proposed future HAW system (Heavy Antitank Weapon). The HAW ultimately resulted in the modern-day TOW. 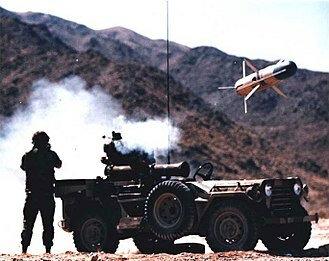 A TOW missile being fired from an M151. Panzergrenadiere of the Bundeswehr manning a forward sentry (de: Alarmposten) during basic training. Panzergrenadier squad ("mechanized infantry") of the German Army. Upon learning of the impending attack, Prime Minister of Israel Golda Meir made the controversial decision not to launch a pre-emptive strike. Wreckage from an Egyptian Sukhoi Su-7 shot down over the Sinai on October 6 on display at the Israeli Air Force Museum. A US Navy sailor fires a MK-18 rifle at a target. 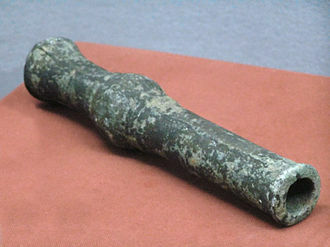 Hand cannon from the Chinese Yuan Dynasty (1271–1368). 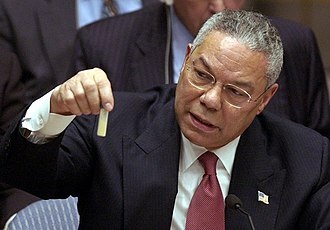 Colin Powell, the US Secretary of State, demonstrates a vial with alleged Iraqi chemical weapon probes to the UN Security Council on Iraq war hearings, 5 February 2003. The Chinese 'self-tripped trespass land mine' from the Huolongjing, compiled by Jiao Yu and Liu Bowen in the mid 14th century. An M4 Sherman tank in Italy in 1943 during WW II. A Leopard 2A7 tank in Germany. A U.S. Army M113 of 1st Battalion, 4th Infantry Regiment provides overwatch while conducting recon operations during exercise Allied Spirit at the Joint Multinational Readiness Center in Hohenfels, Germany in 2015. BTR-152 knocked out during the Hungarian Revolution of 1956. Troop seating in the BTR-152's rear compartment.